Taking on the Everest Base Camp Trek involves travelling to and from, as well as spending time in, one of the most remote regions on earth. While the trek is not explicitly dangerous itself, it does pose various risks which all need to be considered when deciding on what insurance to buy for the duration of your visit. Insurance is an absolute must for any traveller tackling the Everest Base Camp Trek as even small injuries, such as a sprained ankle, can create a logistical nightmare that proves to be quite costly. Even the nightmare of lost baggage is amplified on Everest as you may find that vital pieces of trekking equipment need to be replaced instead of a few pairs of underwear that you might lose on your typical holiday. Finding the correct insurance policy that covers all events and environments associated with the Everest Base Camp Trek is no easy task as the fine print can often run into tens of pages. This article will help simplify all the noise and detail the main considerations for any insurance policy for the trek. We do not sell insurance, we simply provide impartial advice. If you would like an exact quote from our recommended insurance provider click Get a Quote. The biggest difference in buying travel insurance for the Everest Base Camp Trek compared to other holidays is altitude. At the highest point of the trek you will be standing at over 5,500m above sea level, while most travel insurance policies cover only up to 3,000m. The reason for this is the risk posed by Acute Mountain Sickness and other altitude related illnesses. These can be avoided by practicing proper acclimatization techniques and allowing time for your body to get used to the higher than normal altitudes. If symptoms are experienced and don’t improve rapidly, descent is the only option. This can happen by mule back or through medical evacuation by helicopter. If your insurance covers up to 6,000m you will be covered for the entire course of the trek and will not have to worry about exorbitant evacuation or medical assistance costs. As with any mountain trek, accidents remain uncommon but are never completely unavoidable. Once again, remoteness and high altitude can complicate minor injuries, which means that pulling a muscle or cutting yourself on a rock can become serious, fast. Being the most popular route in the region, there are usually people nearby and a first aid kit, if you don’t already have your own, is often not too far away. 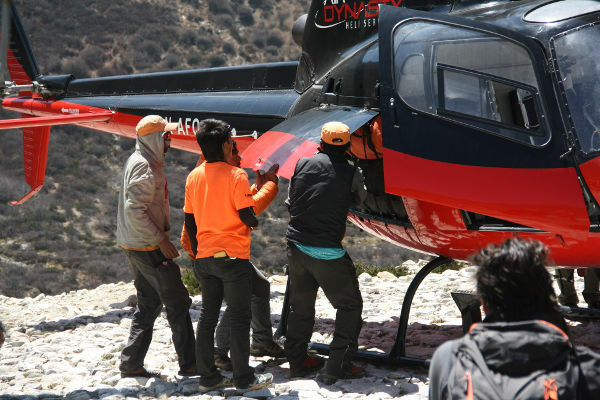 However, your insurance policy should still cover the possibility of helicopter evacuation in the event of serious injury or altitude sickness. You should double check that this is included on top of the standard hospitalization cover. Please note: If you plan to undertake a more serious expedition in the region, like climbing Lobuche East and Island Peak as part of your trip to Everest Base Camp then you will not be covered by standard Everest Base Camp Trek insurance policies as both these peaks stand over 6,000m and require ropes and crampons to climb. Be sure to check your itinerary and if it involves any non-standard routes or mountaineering you will have to contact your local mountaineering association in your country for advice on proper mountaineering insurance. It is a well-known fact that the hygiene standards in Nepal are not up to scratch, so you will want to check that your policy covers hospitalization should you be unlucky and come down with a serious bout of diarrhoea, for example. Some policies will also require you to have various vaccinations before you leave based on your country of origin, so be sure to check before you depart! Nowadays travel insurance always covers lost or stolen baggage but usually only up to a certain value. As you will be carrying fairly expensive and vital gear such as hiking boots, sleeping bags and thermal jackets, you should check with the insurance provider as to how much they will cover. A good tip when travelling to Everest Base Camp Trek is to keep all your valuable items and vital trekking gear in your hand luggage. Also, make sure to wear your boots. In that case, if there is a mishap with your bags you can replace the cheaper items and still crack on with the trek! Most policies will cover cancelled flights to and from Kathmandu, but because the trek involves a domestic flight to Lukla you should check with your policy provider if they cover cancellation of those flights in addition to the international ones. If you have booked with a tour operator the internal flight will be bundled into the full tour price and should therefore be covered if the tour is cancelled. The one policy provider that stands out above others for adventure travel insurance is Worldnomads.com. They offer well-priced insurance that covers most of the considerations listed and will cover treks up to 6,000m. They are very professional and helpful if you have any queries. Make use of their quote calculator below buy insurance for your Everest Base Camp Trek. I bought World Nomads for my trip to Everest based off of your recommendation. But after reading the fine print about helicopter evacuation, it states an attending physician must approve of your evacuation and their one call team. After reading more fine print it seems as though the attending physician has to be someone on the ground. Where are you going to find someone like that in the middle of the mountains? And how are you going to get a phone call to the on-call team before you can have the evacuation? I’m very concerned about the physician thing that seems like a loophole to me so they don’t pay you I’m about to cancel my insurance. Hi Anthony, the fine print on insurance policies are a minefield. I recommend contacting World Nomads to clarify your concerns. On the EBC trek there are medical stations near Base Camp and near Gokyo, however one cannot rely on an attending physician to be nearby if an accident or medical emergency were to arise. Most helicopter companies will require clearance from one’s insurance provider before they fly, so it is worth checking with World Nomads on their policy and procedure. Hope this helps! I would like to know if i could get insured for doing the EBC in 2018. If so, at what cost along with terms and conditions. Hi Saranbir, we are not an insurance provider. I recommend checking out World Nomads. They offer very affordable trek insurance for hikes up to 6,000m (so EBC is covered). Cheers! What are the charges for the insurance for the Everest base camp trek? Hi Mayur, the cost of insurance varies by duration, age and your country of origin. Check out World Nomads for a quote. Any idea if their insurance also covers independent trekkers without guides? Hi Sam, I’m not 100% sure if the insurance is valid if you are trekking unsupported. I would contact World Nomads directly to check. Hi Olga, as you go through the purchase process with World Nomads, make sure to add the Explorer option (not standard) and add sports / adventure activities on the second page (add hiking up to 6,000m). A dialog box will appear about Heli-vac in Nepal. I believe there is a $500 excess. If you have specific questions I recommend contacting World Nomads directly. Hi Mark, I couldn’t see the option for adding sports/adventure, and hence there is no dialog box about Heli-vac, could you elaborate more? Or perhaps a link? Thanks. Hi Gunawan, as you proceed through the process of buying insurance, you will see on the third step a link to add Sports & Adventure activities. As you add the activity “hiking up to 6000m” there will be a dialog box that opens that says there is a $500 excess on Heli-evac in Nepal. World Nomad doesn’t cover for a person over 66, is there any other option besides Nomad? Hi Gunawan, Unfortunately World Nomads don’t cover persons over 65. I recommend contacting your national mountaineering association to see if they can provide a recommendation. In the UK it is the BMC. In the US it is the American Alpine Club.